Escape to the country with our luxurious collection of country cottages, ranging from romantic bolt holes for two right up to accommodation for your extended family and friends. If you have a celebration, birthday or simply need a couple of days away from the hustle and bustle of modern life, please visit us in the Garden of England. 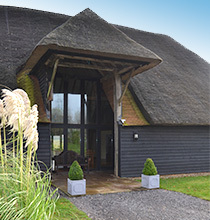 Great Higham Barn is a listed 17th century Kentish thatched barn that has been sensitively converted into spectacular accommodation for up to 22 people. With plenty of space for even the largest of groups, the Barn benefits from luxurious touches and spectacular views. 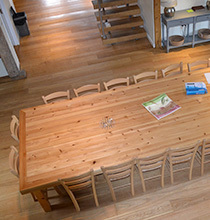 The hall is dominated by a specially made table, which will seat up to 30 for gatherings or meetings. 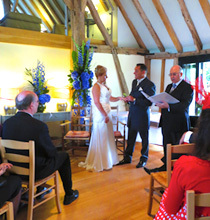 Great Higham provides a magical venue for your vows. With spectacular scenery and luxurious accommodation for a large wedding party, Great Higham allows you to create a personal and memorable celebration. Uniquely we are able to accommodate an intimate ceremony, wedding breakfast, evening celebration and even a honeymoon on site and can help you plan your special day at every stage. Conveniently located just 90 minutes from London and surrounded by country activities including hiking, horse riding and cycling, as well as clay pigeon shooting and with golf nearby, Great Higham offer the ideal accommodation for families, group celebrations or simply getting away from it all on a well deserved break with friends. Great Higham Barn and Cottages form part of the Torry Hill Estate, and the 2,700 acres of working farm and forestry, with its cherry and plum orchards. From luxurious bespoke features and its own swimming pool, tennis court and extensive grounds to enjoy, Great Higham has all the ingredients for a truly special break.